Sometimes when creating an Android app that includes user profile picture or avatar, we need to include a feature that enables users to select and crop image to update their profile picture. 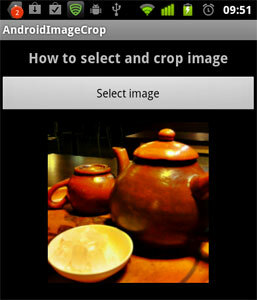 On Android we can accomplish that by using intent to open image cropper app. 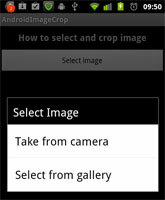 To select an image from files, we can pass an intent to image gallery or file manager app then pass the selected image path to camera app to crop the image. It is also the same if we want to take a picture from camera, by passing an intent to camera app to open the camera, take a picture than save it to specified Uri then crop it. I’ve created a sample project to show how to select and crop image from files or from camera. The source files can be downloaded from my github repository (see the bottom if this post). 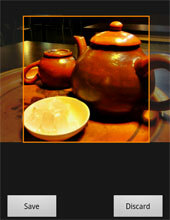 Line 9: To take a photo from camera, pass intent action ‘MediaStore.ACTION_IMAGE_CAPTURE‘ to open the camera app. Line 11: Also specify the Uri to save the image on specified path and file name. Note that this Uri variable also used by gallery app to hold the selected image path. Line 24-29: To select an image from existing files, use Intent.createChooser to open image chooser. 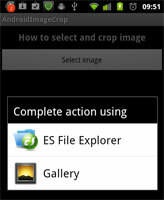 Android will automatically display a list of supported applications, such as image gallery or file manager. Line 4: Open image crop app by starting an intent ‘com.android.camera.action.CROP‘. Line 7: Check if there is image cropper app installed. Line 25: There is posibility when more than one image cropper app exist, so we have to check for it first. If there is only one app, open then app. Line 33-68. If there are several app exist, create a custom chooser to let user selects the app. Line 11: After cropping the image, get the bitmap of the cropped image and display it on imageview. thanks for the usefull post. but how can i use the cropped picture in other classes? Hi tom, you can save it into temporary file then load it from other class. Image cropping is in square shape but how can crop in vowel shape ? hi any one know how crop and image as ovel shape…could u help me to reslove this problem…. Hai i am facing the same issue? ?how to crop in ovel shape do u get any results in that pls share it…. after cropping the image and there are two buttons SAVE and DISCARD. so on clicking save i want to save it in the SD card how can i do that?please hepl me in doing that? look at onActivityResult(int requestCode, int resultCode, Intent data),crop app returns bitmap of cropped image, you can save it on sdcard. Bitmap photo = extras.getParcelable(“data”); //save this bitmap into sdcard…. hey i have save my image taken from camera in SD card nad when i use that path for showing image its null.where the problem actually is? but its showing null pointer Exception when accesing that path to show that image.problem may be its not saving that image to specified path. Could you give me the log cat messages? sory I have deleted that.hey just help me I have given the aspect ratios in intent.but it’s not showing it.How to do that?as it is cropping but not taking aspect ratio?Why is this happening? Thank you for the great example. It works very well. I have one problem though. Even though I am specifying EXTRA_OUTPUT for the image capture (the cropped image is being successfully saved where I specify), the uncropped image is also being saved on the sd card in the camera’s default save location \dcim in both the \.thumbnails and \Camera directories. How can I prevent the image from also being saved to the Camera default directories? can i remove save/button so after i take a picture it always save to sdcard. Would it be possible to crop rectangles instead of only squares? Now, if I move one side the adjacent side moves along, keeping it a square selection. Thanks for your such nice code. Same code is working in Table but i m surprised it is not working in xperia device. Galary crop is working fine but camera photo crop is not working. When i m taking photo then crop option should come but i m not getting that option. I m sending few logcat part. Plz find in below. Please suggest me what is the problem. I need ur help to fix this issue. 10-28 21:27:29.355: ERROR/SemcCameraApp(5351): VideoController:releaseMediaRecorder: mVideoDevice is null. 10-28 21:27:29.605: ERROR/CropImage(1816): Cannot load bitmap, exiting. That means the camera app didn’t write the output into temporary file. I also had the same problem. But with a little debugging, I noticed that if I add a small delay (50ms) before doCrop() call, it works fine. In my case, theh problem was that doCrop was being called before the camera app could finish saving the new image file and hence the NULL pointer. After adding this small delay it worked fine for me. Once again great example- saved time and worked without problems. i’ve got some problem during implementing your code in my device, i’ve got se x8 device. the picture was successfully taken within this app and saved in my sdcard. can you help me explain what i’ve got here? Thanks for the tutorial. I have been trying to implement the code into my project. when i choose an image from Gallery and when it has to open the cropping application the application crashes. Hope the code was enuf for you to understand whats going wrong. That means crop app was not available on your Android phone (null pointer). But, that’s quite strange, android managed to resolve crop app and found com.coolirils.media but it could not be started and not found. What android version & phone model did u use? After cropping there are ‘Save’ & ‘Discard’ buttons. How can I change the text on the button? Say, to ‘Done’ & ‘Cancel’. You can’t change the button, that’s android built in app. A Question on Cropping. When i try cropping an image after taking a pic, it shows a rectangle, When i try seleting area or object,the other sides of the Rectangle gets resized which i dont wanted. can you please help me in that. how if I want to crop image not from uri, but from created bitmap? Your code is so clean and able to understand. You are a hell of a android developer!! Thanks for the tutorial, really nice work save time for me. I tried to implement your code its working fine when implemented with single java file. How do I resolve this.. Very clean and understandable code. I don’t have devices for debugging the problem. I am testing this application on 2.3 and 2.3.3 and below of 2.2 also it’s working fine but it’s not working in 2.2 it’s getting force close error.can you please solve my problem. I need code which cropping images and set as wallpaper. All images comes from web service. I have made one app which display all iamges when user select any one then i creaet new page where user crop that and set as wall paper but functioanlity works but not getting correct resolution. how to convert image in to pdf format in android? hello, i am trying to crop image respecting the size of the screen but when i try to pass rectangle dimensions, onActivityResult() is not called! …selecting image from camera and gallery is working. Just pass ratios as 4:3, 16:9 for aspectx and aspecty.. where as pass values lesser than 300, when i used height and width gallery got force closed.. May be it happened because of the resolution of image being lesser than height and width of device[I am not sure]. Hope this helps you.. Correct me if I am wrong.. I am using this code fro the Samsung gallaxy and it is working purfectly fine but it is not working properly on the htc wildfire. I think it is not saving the image properly. for that i need to pass a bitmap to the croping winodw instead of using the uri of an image can i have a suggestion about that please…. hi any one know how crop an image as ovel shape can u help me for this…. I have already select an image. I want to crop that image and after cropping i want that image to show in my app. Is this possible? Haiii ,its very use full tutorial . i am facing one problem here. 1. In this tutorial when the save button click its will store in sdcard but can we customize the location where it should been stored? ?where we change the code?? 2. can i want customize the camera preview, is it possible?? Thks for u’r reply…can u help me to crop the the image in ovel shape …in my current project i need to crop the exact face and render the crop image into my activity and need to place into my frame …. on my current project i need to crop the exact face and render the crop image into my activity and need to place into my frame …. or is their any way to render the exact face in my activity???? Is their any way to crop the exact face on cropping image???? Please can tell me how to find the height and weight of crop images. I am try for many days. Hey lorenz , Gr8 tutorial and thanks for sharing the code . I’m not able post the cropped image from Gallery to server , it sends an original image but when I’m using camera ,everything works fine . Hey lorenz , I’ve fixed that problem . Hey lorenz , I want to add an image filter buttons at ImageCrop Intent . How can I add it ?? Thank you so much… your site helped me a lot…. I just like to know this code supports on all devices…. or i need to implement a customized camera screen.. to support on all devices…. Hey lorenz ,A very Gr8 tutorial …. could anyone thrwow some idea how to do this ??? how to change the image size dynamically like using a motion event when the screen touched? The example you provided, final result of the image is given to 200×200 but what I want is the user can resize the rectangular by touching the screen. This code is not working on Motorola devices.Is there any external parameter that i need to pass ?? The code example will not work on all versions of Android, nor will it work on all vendor’s versions. This bit of code relies on code that is not part of the API. AFAIK the only way to do cropping is to put the code directly in your app. I have a problem with this code in Android 2.3.7 and Android 4.0. Do you know what happen? Could you tell me how to resolve it? 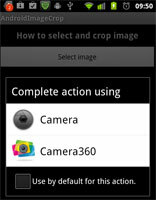 The “com.android.camera.action.CROP” is not part of the public API and was removed. So, Is it not possible to make crop in all Android versions? Could you give me a suggestion about how to make a image crop for all android versions? hi, i’ve got a problem.. if I take the photo from the gallery is crop normally, but if I take a picture the device told me that the gallery stops working… why? Really thanks.Your code helps me to remove my stress. Complete solution thanks for tons ! how to make the croped image resolution 1024×1024?? i am new to android. I want coding to crop the image in irregular shape.Thanks in advance. Great tutorial .Thanks for this. How can i save the cropped image? Can i save that cropped image in gallery ? Simplest tutorial showing how to capture images from camera or gallery. Thanks a lot! Hi Shridutt, thanks for the report. I don’t have kitkat device, hope can test it soon. Excellent! Thanks for this contribution.